1.5 5: Waterproof or water-resistant binoculars? The magnification factor of binoculars perhaps is the best factor to consider when choosing the ideal one for astronomy. The magnification power of binoculars is described in two numbers, separated by magnification factor “x”. For instance, a 7 x 35 magnification lenses mean the binoculars will make the object appears 7 times closer, while the second number (35), is the diameter of the object, measured in millimeters. When purchasing Binoculars for astronomy, you need to keep in mind that the higher the magnification the larger the image that appears but the dimmer the image becomes. Similarly, a larger magnification also means that your field view will become narrower, and it becomes even more difficult to keep the image focused. Experts suggest that you choose a magnification lesser than 10x if you need a wider field view. If you struggle with focusing your image then you should consider mounting the binoculars on a tripod socket. Most Binoculars for astronomy come with glass lenses, and they provide better imagery than plastic lenses. Pay attention to the lenses coating; a coating rated as “C” means a single coating layer is applied to an area on the lenses, while “FC” rating means all the glass lenses surface has been coated. Lenses rated as “MC” means parts of the lenses surfaces have been coated with multiple coating layers, while “FMC” rating means all the surface areas of the lenses have been coated with multiple layer coatings. You should consider multiple-layer coated lenses because they provide superior image qualities to single-coatings, though they come at higher prices. It is important that you check the eye-pieces of the binoculars too. The eyepiece should rest comfortably from your eyes. The distance between the eyepiece and the eye is measured from between 5 and 20 millimeters. If you don’t wear medicated or sunglass, you can comfortably choose the one with a rating of less than 14mm and if you do you should choose the one with eyepiece rating of over 14mm. You should also consider binoculars with rubber eyecups, they make viewing more comfortable for those using sunglasses. You need to test the focus capability of the binoculars by looking at how well the device can retain focus at different distances. Most binoculars do come with a center-post focus mechanism that works with a diopter corrector that allows the stronger eye to maintain focus on an object. Some binoculars are simply “focus-free”- these ones can put serious strains on your eyes. Make sure you go for the binoculars with focus aids if you are purchasing one for astronomy purposes. In most cases, binoculars for astronomy have their lenses spaced wider than the eyepieces, this is why most binoculars are larger but ensure that nearby images appear in 3-dimensional styles. Consider buying binoculars that come with roof prisms because they allow the main lenses to rest in line with the eye-pieces and such binoculars are more compact, though the image quality may slightly be lowered. Porro-prisms, also referred to as the BAK-4 prisms will deliver rounder, lighter and sharper images, while the BK-7 prism binoculars are cheaper but sometimes square off one side of images. 5: Waterproof or water-resistant binoculars? Nature can be unpredictable sometimes, hence you want your binoculars protected effectively. You should choose the water-resistant binoculars if you don’t plan to use them quite often or if you don’t want them to get wet frequently. On the other hand, you may want to take your binoculars with you, especially when going on skiing, and white-water rafting adventures. In this case, you need water-proof binoculars. Though the costs of similar binoculars with waterproof or water-resistant qualities can be similar but do not confuse water-proof with water-resistance, they do provide similar and different protection for binoculars. You don’t have to be told that Binoculars with no manufacturer warranties are a bad risk, because you are not covered under any return agreement, just in case, the binoculars become faulty. The best binoculars usually come with manufacturer warranties of 2 years or more. Any Binoculars brand with less than 6 months warranty may be of poor quality especially when the price is also cheap. One of the most important things you must check when purchasing binoculars are the manufacturer warranty. Sometimes, the warranty may come with the instructional manual. 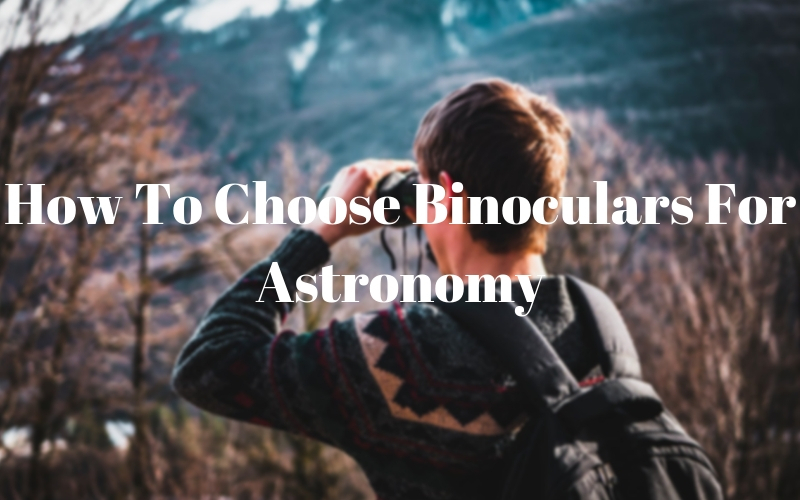 When choosing your ideal binoculars for astronomy, you may want to consider other factors such as the weight of the binoculars. Generally, Binoculars with higher magnifications and larger lenses usually weigh more than the standard binoculars, for this reason, stabilizing binocular with bigger weights can be a challenge for many, especially beginner users. You may want to consider getting a pair of tripod stand to balance the weight, and improve stability. Tripod stands also make it easier to transport your Binoculars from one point to another especially through the use of neck straps. If you love taking your binoculars over long distances, you may want to consider lighter and less powerful binoculars. Spending the extra money on some accessories such as binoculars case or bags, and tripods can be a huge investment, especially if you plan on using your binoculars for several hours at a time. A tripod stand may reduce the risks of straining your hands and accidentally dropping the binoculars.